No one but a northerner who has survived months of freezing temperatures, snowstorms, and cloudy skies can appreciate in quite the same way the first perfect day of spring. It is a little bit of heaven. Everyone (including yours truly) was out and about in our little downtown on Saturday, drinking coffee in outdoor cafes, strolling with their dogs in our central park, shopping in our little boutiques, and just generally soaking up the glorious sunshine and warmth. What a gift! This week is expected to be cloudy and rainy, but that's okay. Everything's greening up so nicely, and you know what they say about April showers . 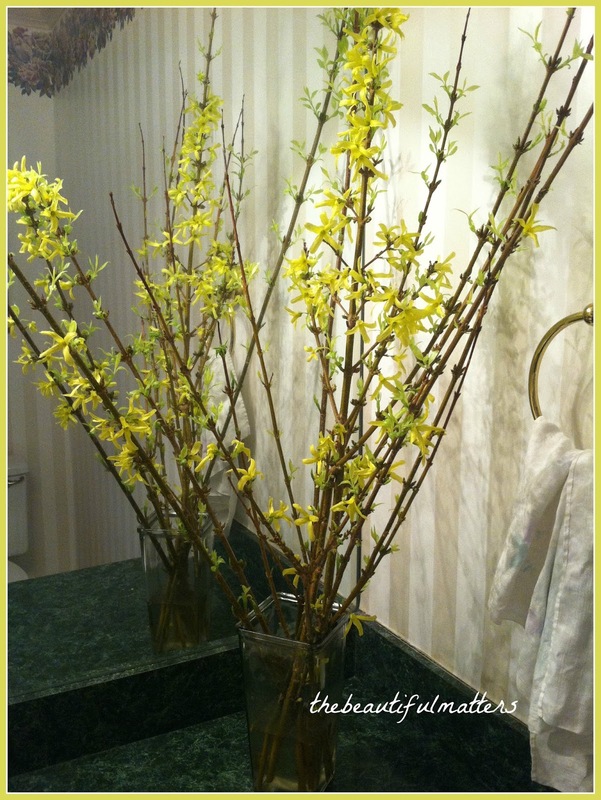 . .
My first spring gift came from a book club friend, who brought over these forsythia branches she'd trimmed from her garden. Here they are a week later . . .
Another book club friend was spring cleaning, and called to ask if I'd like a silver-plated tea set. Such a silly question. Isn't it gorgeous? Thank you, Debby. He took a couple days off after the 15th, and we had a nice little stay-cation. We saw a movie, went out to eat a few times, and just relaxed and enjoyed each other's company. Thank you, Mr. Beautiful, and thank you for working so hard. A teaspoon in desperate need of polish -- this was my grandfather's baby spoon. I am putting together a book of family recipes for our youngest, who is graduating from college in a few weeks. He loves to cook, and requested copies of his favorite recipes. I was able to find some "manly"-looking recipe cards. One more peek at that beautiful tea set . . .
Hope you're all enjoying some gifts of springtime, too. Linking up with A Well-Styled Life. Please join us! Oh my gosh, I can't believe the gifted tea set, Deborah! I am swooning over here and wishing I had someone who wanted rid of one! 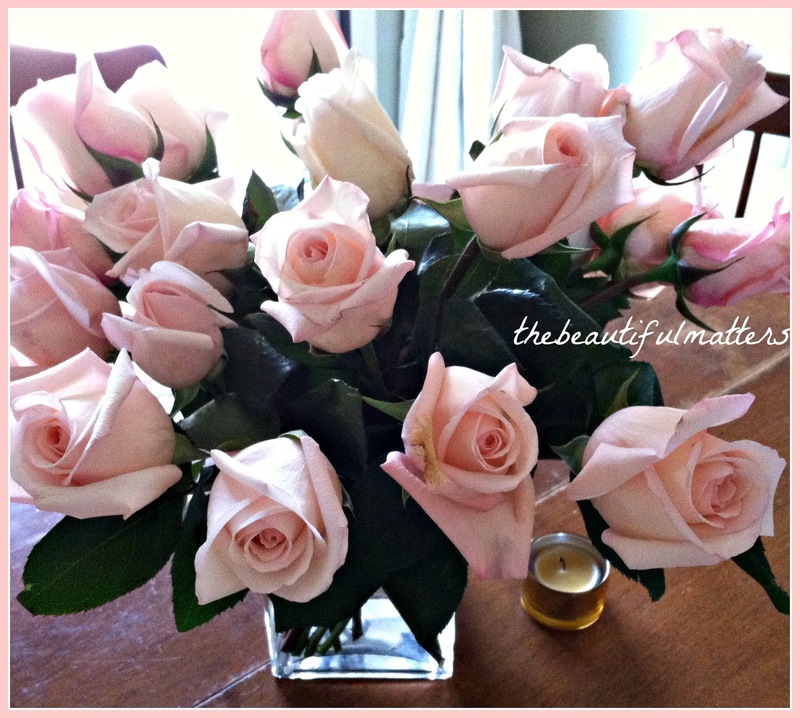 I love your peachy roses...what a sweetie your hubby is. The recipe cards will be perfect for your son. What a lovely post, Deborah. And such wonderful Spring gifts! So glad you shared these delights with us today. What a happy week for you, Deborah! We have had so much rain, and I was just comparing photos of my yard taken today to those I just posted - it's simply incredible how fast everything is growing and greening up. Every day is a gift, it really is. Your roses are especially beautiful. You have really had quite the blessed week with nice weather and so many nice gifts. The forsythia are so pretty. The Silver Tea Set is beautiful. The roses are beautiful. What a nice gift from you to your son; by writing out recipe cards for him. How thoughtful. Hope you don't have too much rain and can enjoy some more days outdoors enjoying the sun and warmer weather. Hi Deborah, what nice weather we had this weekend! I love the pretty tea set & flowers from your friends. Your husband gave you beautiful roses! Love the recipe cards. Enjoy the week. Sweet spring blessings! You described your day out so well. 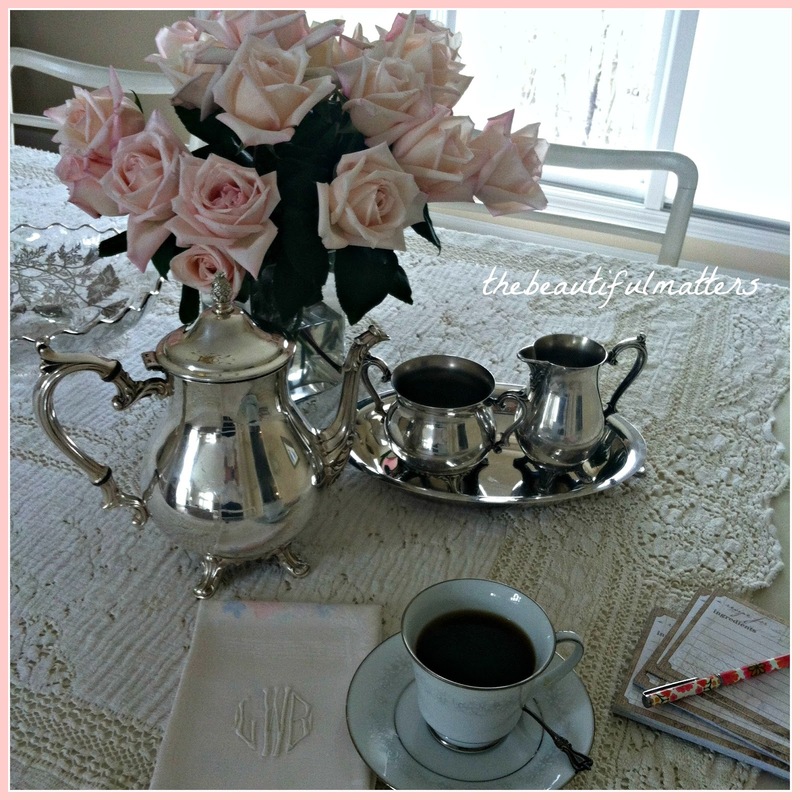 The roses are beautiful and the silver tea set...wow! I am quite envious of the forsythia as there won't be any blooming here this year. What a nice gift the recipe cards will be. 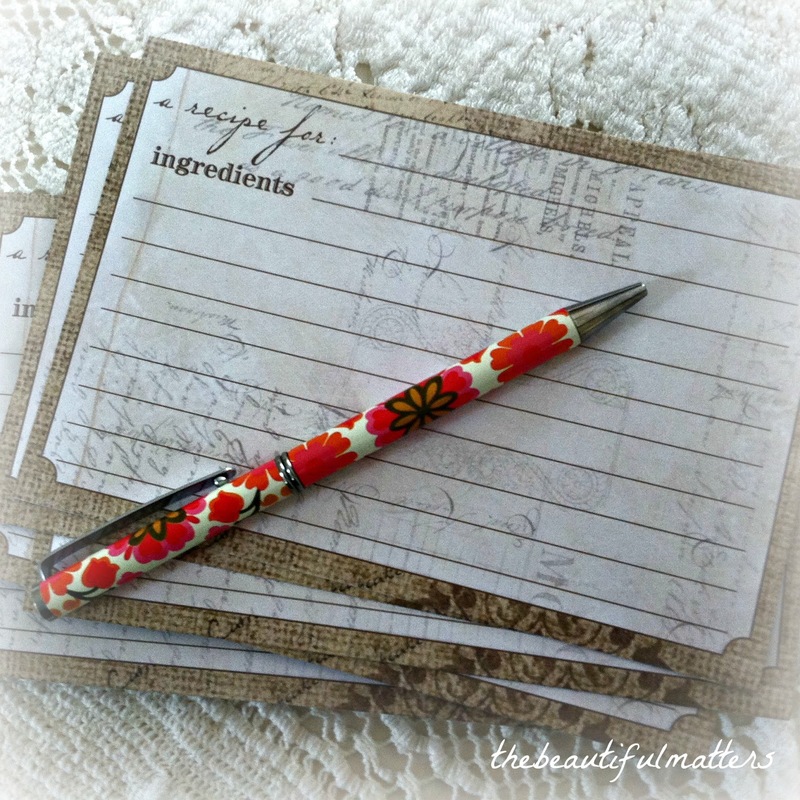 Hello Deborah, I love that you are making the recipe cards...what a treasure! 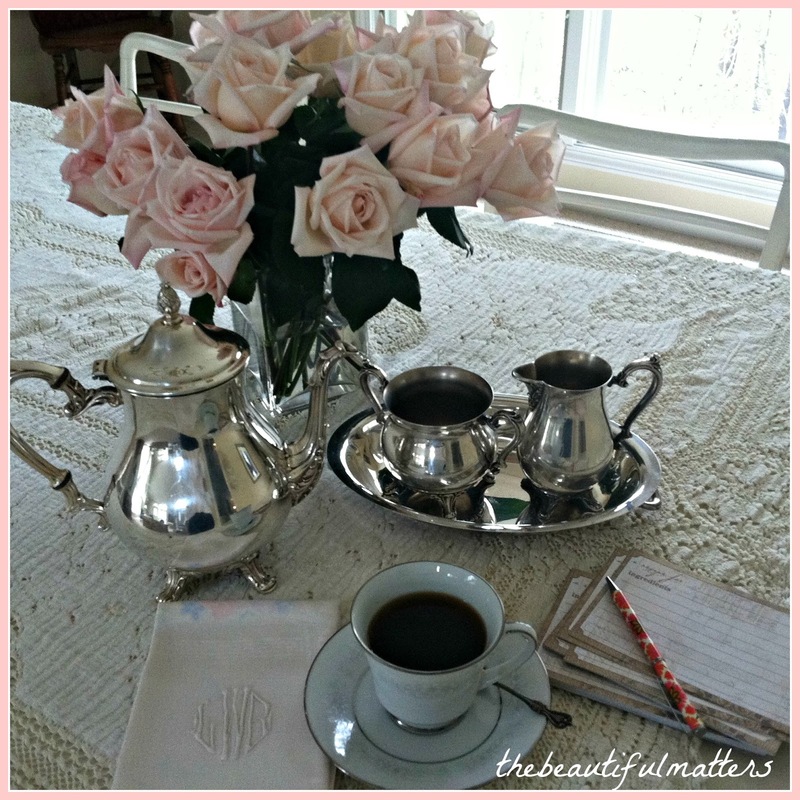 Beautiful roses, so delicate and oh, what a gorgeous tea service and baby spoon. I enjoyed my visit. Have a good evening. You sound so bubbly and no doubt those spring signs did lift up your spirits! What wonderful gifts you received and your selection of manly looking recipe cards is excellent! How wonderful to pass down a generation family recipes. Beautiful tea service such a generous gift and a thoughtful husband, it doesn't get any better than that. What a lovely post! Quality time with hubby, sweet gifts received and a wonderful gift of favorite recipes for your son. Hi Deborah, Isn't spring grand. 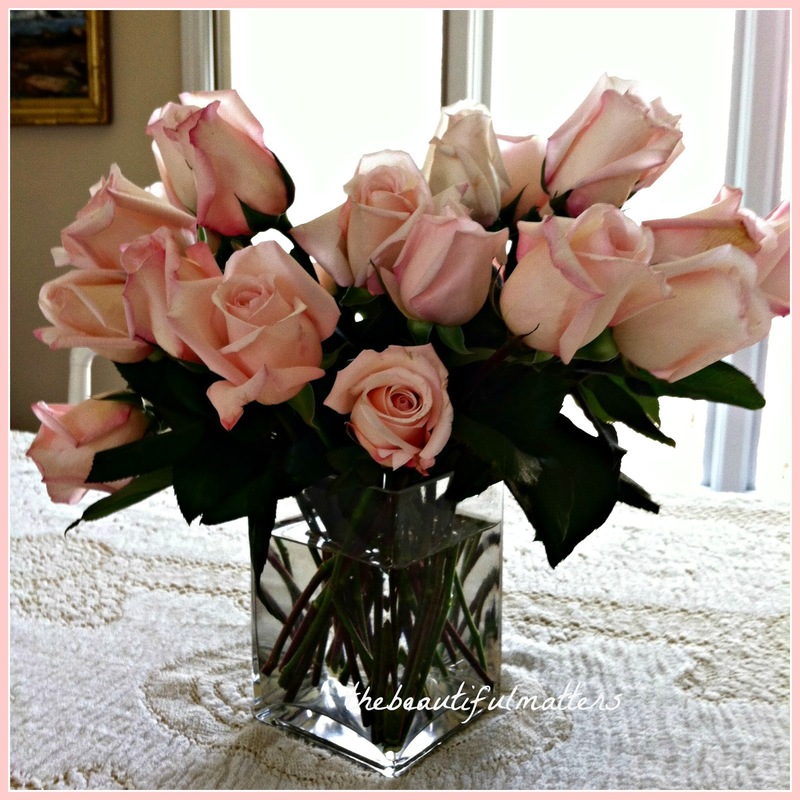 Love your flowers from your friend and your pinkish roses are gorgeous.How sweet of your hubby to gift them for you after the hustle of tax season. How special to be gifted the silver tea set too. Perfect for you!! Great idea to give your son the recipes of dishes he loves. Looks like spring has sprung there in Michigan and I know you are ready!! Thank you for stopping by and your kind comments and visits. Wishing you a lovely week. What an absolutely gorgeous silver teaset from your friend and magnificent pale pink bouquet of roses! Mr. Beautiful really is a keeper! Oh...those roses! Such a lovely, soft color...how sweet of Mr. Beautiful :) I love the idea of you writing the recipes out for your boy...something I'm sure he will cherish! Just gorgeous! That really was a silly question about the tea service:) I have my Grandfather, Garandmother and mother's baby spoons! Alaso in need of a polishing. I don't use them because they're so small...but I should. 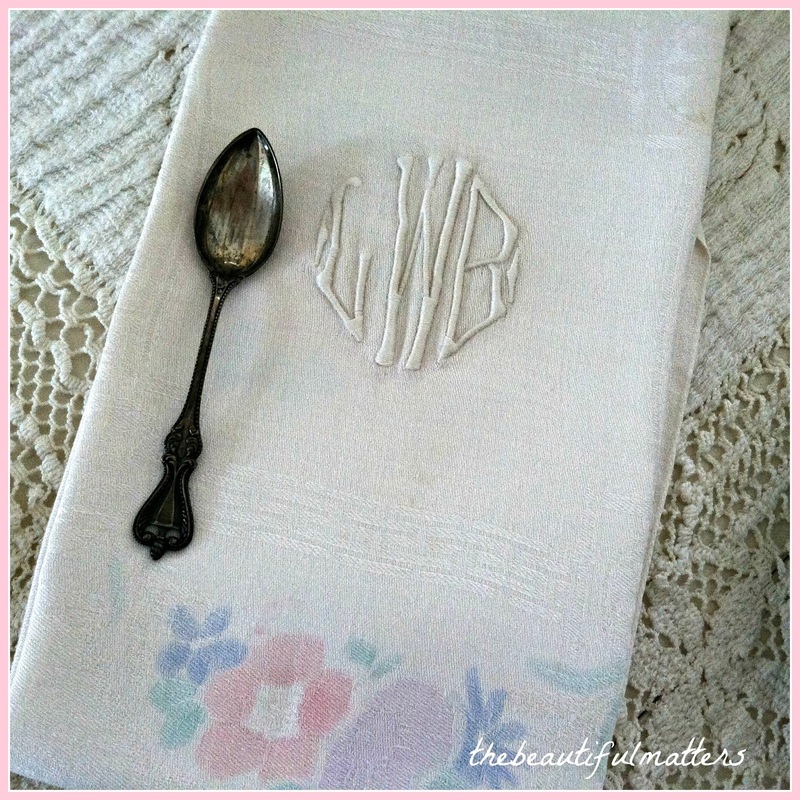 We are having as lifestyle linkup on my blog this Friday and we would love for you to share. This post would be perfect. It's all about what inspires our lifestyle. I hope you can join us. Everyone is welcome! Love the tea set...and the roses ...and your son wanting your recipes. :) Priceless. What a pretty tea set from a friend, and love those roses. Lovely post Deborah. I love your wonderful family items! And what a lovely bunch of roses! Tax time must be hectic around there! When my son moved into his first place I did the same thing with recipes...and got called alot for ones I had forgotten. I think it's great that our guys nowadays can cook too. My son's a great cook! Let's hear it for family! I agree with Deb above - the gifts are made for each other. OH! OH! OH! I have 2 spoons exactly like your grandfather's baby spoon (I think, from what I can see in your picture). They were in a relative's family, and even as a child I was fascinated by them. Even the relative seemed never to know just where they'd came from, nor whose they were originally. That relative would be 104 if she were still living. My spoons are more the size of regular teaspoons, as I recall, and I've used them before when serving tea for one guest (plus me). They're engraved with Mc (which is a family last name initial-compound). Maybe I'll dig out mine and take their very tarnished pictures. If I do, I'll put the result on my "It's Only Write" blog... I'd love to know more about such spoons! I did put a few photos of one of my spoons on It's Only Write. I don't mean to make a deal out of this, but I was so intrigued by these spoons in childhood.. and I guess such fascination just lingers on! Beautiful tea set and roses. They look like they were made for each other. So glad that spring is finally making herself known in your corner of the world. 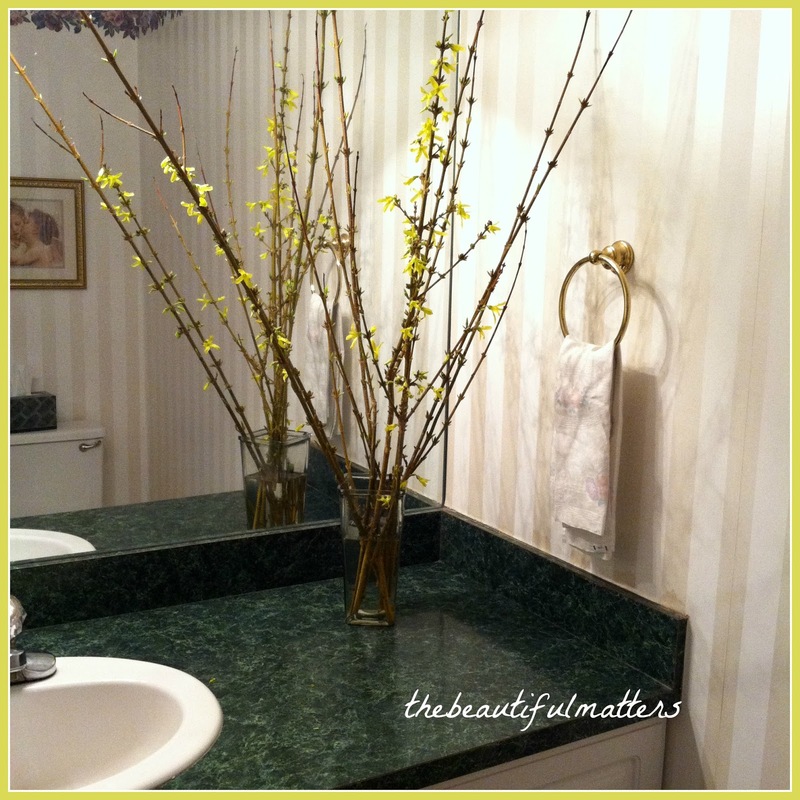 Forsythia is such a cheery thing! Have a wonderful day. Sunny, spring days are certainly a refreshing change after those northern winters, indeed! Such lovely gifts from your sweet friends, Deborah, and they both look beautiful in your home. Great idea to jot down some of your son's favourite recipes for him. I'm certain he'll make good use of these recipe cards, handwritten for him by his mother! What a perfect post to show your creative and lovely lifestyle! The roses are gorgeous and you found the perfect 'manly' cards for your son. How fun that he likes to cook-we always appreciate a man who enjoys the kitchen. :) Happy spring to you! Thanks so much for joining us on the #stylefocus LinkUp! ROSES........say no more!! !MIne are popping today after our little downpour last night! What inspiration for a Sunday morning! I'm so glad you received these lovely spring gifts! And that tax season is over and you both had time for a little staycation. I love all your pretty gifts and that napkin under the baby spoon is lovely too. Hi Deborah, just coming over from Heather's link party. 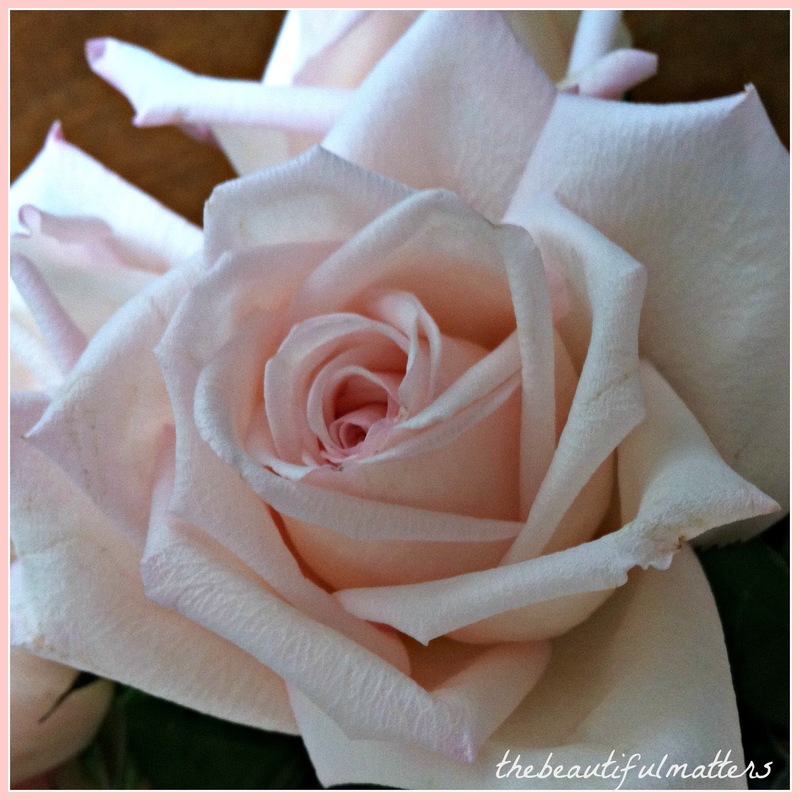 These pink roses are just lovely, and what a soft and pretty color. And I really like the silver tea set. It reminds me of the one my mom used to have, and I would sometimes clean it for her with polish. So glad I stopped by to see your sweet post.